I had never heard of methylation (or at least I didn't pay much attention) until last summer. It seems I have found a key piece in the puzzle..of my experience, and hopefully something helpful to share with you too.. I became aware of the process of methylation for myself, when I decided to switch to egg white protein powder in my smoothies. I just wanted to try a switch from the other protein powder I was using.. I had also read that egg white protein powder also had a high tryptophan content, which would also help to boost serotonin levels, so I thought that was a nice bonus. After a couple of weeks using this powder I started to noticed a new level of detox in my body. I was having similar cleansing symptoms as when I first started Candida cleansing years ago. I didn't connect it to the egg white protein right away, but it was the only thing different in my diet. As I researched, I found that egg white not only contains high tryptophan levels, but also is one of the highest food sources of sulfur. Sulfur, I soon found out, is key in the methylation process. The methylation process is also key in helping the body to detox. I also discovered that Sulfur in and of itself, is also key in helping to cleanse fungus and bad bacteria. I realized this a couple of weeks later, while traveling in Washington State while having a conversation with the farmer I was staying with. While we were walking and he was showing me his apple orchards, he mentioned that they would be spraying in couple of weeks. I asked what they would spray on the trees and he said Sulfur, which is to kill fungus that would affect the fruit otherwise. Sulfur as it turns out is key in helping the body to detox, and also in the methylation process. You can also supplement with MSM, for more sulfur. Also, here's a list of foods high in sulfur content. Also, methionine and cysteine are the two sulfur containing amino acids. (..methylation is) the addition of a single carbon and three hydrogen atoms (called a methyl group) to another molecule. The removal of a methyl group is called de-methylation. Think of billions of little on/off switches inside your body that control everything from your stress response and how your body makes energy from food, to your brain chemistry and detoxification. That's methylation and de-methylation. 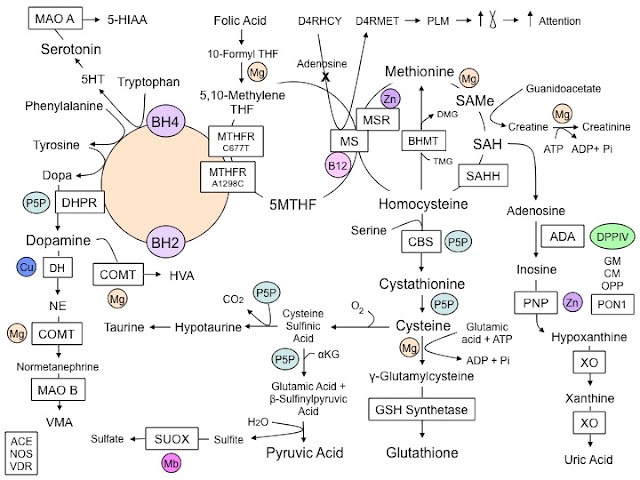 The Methylation process is also key in creating Glutathione, an important antioxidant. Here are some other key things I have learned. Under-methylators can enhance the methylation process using supplements. I started by taking "Sam E" and Methyl-cobalamin (b12). I started with low doses by breaking the pills in half and worked my way up. I am also now rotating in MSM occasionally. When I first started the Sam E I detoxed a LOT. I thought this was unusual as I had already been working on cleansing with probiotics and better diet for a few years. I learned that the Sam E also helped to cleanse the liver and improve joint function. I think these two must be connected because as my body adjusted my knee joints also ached terribly. The knee pain lasted for several weeks, but finally cleared with the other detox symptoms. I have since learned that probiotics and digestive health are also key in supporting the methylation process, as Candida's toxin byproducts can inhibit the methylation process. Niacin soaks up methyl donors -- ie the antidote for "overmethylation"
Increased methylation can also help lower histamine levels. Melatonin (a powerful anti-oxidant) affects methylation. In turn, Meditation, and other factors such as lighting, can also stimulate the production of more melatonin. ..these are just a few of many interdependent actions.. Here's a series of videos on youtube that help to understand this whole methylation process more simply. the weeks before, I was eating a ton of garlic (which also has a high sulfur content, is anti-fungal and contains methyl donors) and also eating kefir grains. I feel that the awakening and the detox of candida were linked.. So, my guess is that I was speeding up the methylation process by eating the garlic and kefir grains, and then the methylation process was getting even more of a boost in methylation as the candida was dying off. My serotonin levels were starting to increase too as my body was adjusting.. So, serotonin is produced in the body by the amino acid tryptophan.. and the Methylation process is supported by methionine. Then the whole awakening process was kicked off by the meditation in the height of all of this. 5-MeO-DMT is what is produced by the Amazonian psychedelic brew called Ayahuasca. From everything I have read about ayahuasca experiences they are very similar to what I experienced spontaneously.. Ayahuasca is basically plant based DMT too.. so I feel that it's possible that in my experience I produced a sort of DMT experience in my own body thru meditation), and that by supporting the body's naturally balanced chemical processes we can support the awakening of higher perspectives and awareness through meditation. I also think that it is biologically advantageous for the mind and body to raise this awareness, and shed the ego-based identity, as this is hardwired into the reptilian brain and triggers ongoing stress responses. I have a basic understanding about these things, but am by no means an expert... I am always interested to hear other perspectives.